There are some restaurants that you just love. The food has to be good for sure, but it's more than that. It's the vibe, or the welcoming service, or the relaxing patio, or the friendly chef. Or it's all of the above. And maybe that restaurant just comes along at the right time in your life and you have irreplaceable memories of just being there. So it is with me and Laughing Ladies in Salida, CO. Laughing Ladies is a Salida institution of recent memory, having not only survived--but thrived-- in this quiet mountain valley town for 18 years now. I first dined there 11 years ago when I was spending a summer in Salida as a poor graduate student. I remember being enchanted by the day-to-day life in Salida, but as far as food was concerned, I was eating what I could afford on my modest budget which mostly meant cooking for myself in a shared kitchen and with very little time. I was treated to two meals at Laughing Ladies by a family friend who was visiting her son nearby. These glorious sit-down meals on the back patio of Laughing Ladies were among the highlights of my magical summer in Salida. Years later, my wife and I came back for a get-away vacation and the night we dined at Laughing Ladies was also the night we learned she was pregnant with our now almost 4-year old boys. It wasn't her best meal --only because she was severely nauseous-- but our shared memory of the excitement we felt that night is so vivid that it will forever be etched in our memories. It was truly our last meal where we were only living (and worrying) for ourselves. Almost every waking moment (and most sleeping) since that day our priorities have shifted to the mini-people we now share our lives with (meaning our kids, not our live-in butler). Then this summer we returned, almost 4 years to the date of our last meal. This time with kids, and to celebrate my wife's birthday. 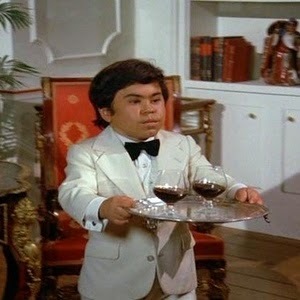 And even though we had two squiggly toddlers with us, we were treated to the same excellent service and welcoming attitude. We ate another excellent meal and our kids, perhaps also sensing the magical powers that the restaurant seems to hold over us, not only cleaned their plates of fresh salmon and grilled asparagus, but behaved almost angelically. Another unique memory that I will hold on to forever: my kids behaving well in a restaurant. When we started planning our trip to Salida, there was no doubt in our minds that we were going to Laughing Ladies, though I have to admit I was skeptical that it could still be good all these years later under the management of the same chef/ owner team. The menu was slightly different, but the ever-so-slight Southern Colorado or even Mexican flair that I have come to love was still present (although maybe to a lesser extent-- I still talk about a duck mole I had there once as one of my favorite dishes ever), as were the gigantic portions. What we ate that night was as good as I remember it. I had a crispy leg of duck paired with a locally made Andouille sausage over a bed of mashed sweet potatoes and a spicy red bean hash. Unfortunately, my pictures have somehow been lost from that night (though if you want to see some of that duck mole, check out my post from 4 years ago). It's appropriate I suppose, as the point of writing all this is not to necessarily highlight the food, but the experience. Of course the experience would never be the same if the food wasn't good, and I really would have liked to share my pictures of the tasty, creative, well-presented and hearty meal we shared, but since technology and I will never, ever be friends, we will just all have to use our imaginations. 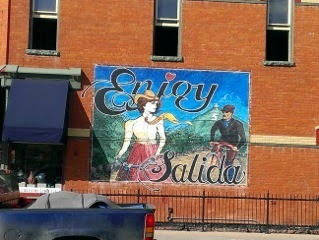 Instead, I will share one last picture of Salida. A parting shot, so to speak. 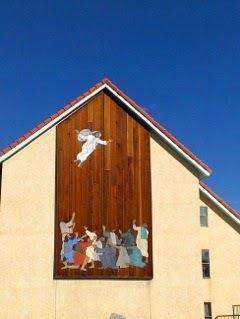 It's Jesus, in case you were wondering, totally doing a stage dive on top of his disciples. The church of Punk Rock Jesus? It's Salida. It wouldn't surprise me.